I never used to like pink. I mean, I went through a phase when I was like four and I demanded that my room be painted pink. My mother kindly did this for me. Later, the room was painted a bright yellow. I distinctly recall returning from camp or something and the room suddenly being yellow. My mother had painted it while I was away, though I do at least remember that she had asked me if I minded it being yellow before she painted it. During this whole time, I refused to wear pink. Pink, I decided sometime around second grade, was not a color for me. I’m saying all this, because I have completely come around to pink. I think it is a beautiful color. I have to stick to brighter or darker pinks in the real world, but in paper doll land, the sky is the limit on my shades of pink. 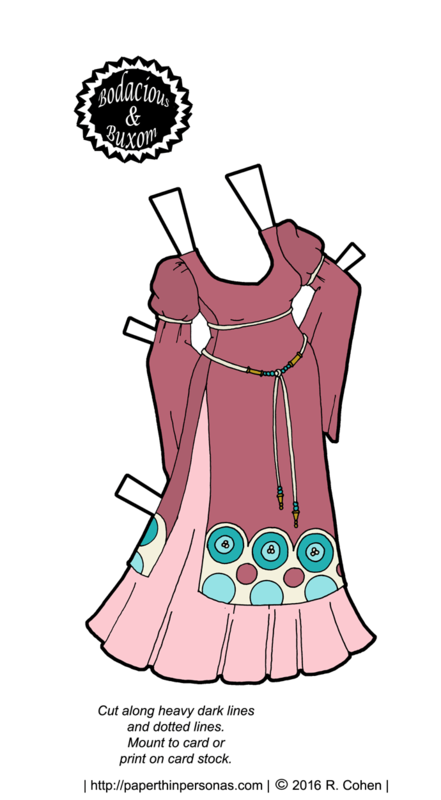 So, today’s paper doll dress was colored using the color scheme from Dreaming Princess as the base. Dreaming Princess is one of the most complexly patterned sets I have done in years and the color scheme was a real struggle. Still, I loved how the original set came out and I wanted to adapt those colors to today’s paper doll dress to print. Every paper doll dress is a little different, of course. Yesterday, we had an autumnal scheme. Today’s dress, I think is more spring-like. I am, I confess, not totally pleased with how the hem detail turned out. I didn’t properly adjust it for the curve of the paper doll’s body. I’m a bit disappointed in myself. Anyway, enjoy the paper doll dress! Tomorrow we have shoes and stockings. Haha, I’m glad I’m not the only one who went through a “hate pink” stage. Mine lasted for decades, though, and it’s only been in the last ten years that I realized that pink isn’t such a bad color after all. I love the rose colors in this particular gown, it really compliments the design.